The title of this article is ambiguous. James Bond (Disambiguation). 3.64 points at 11 votes (rank 840). Example for entering a code before part 2 and 3 or the final. 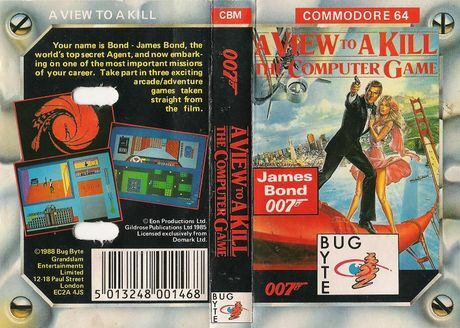 A View to a Kill - James Bond 007 is an arcade adventure in 3 parts which is based on the movie James Bond 007 - A View to a Kill. The aim of the game is to uncover the plans of Max Zorin and of course to hamstring them. You get the necessary information at the main places of the movie: Paris (meeting with agent May Day), the mysterious City Hall of San Francisco and in the Silver Mine of Silicon Valley. The adventure is played in real time against the clock. 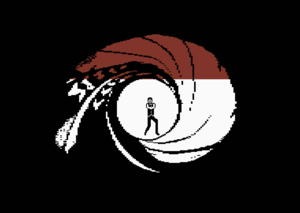 You take over the task of the world-famous agent of the Secret Service: 007 - James Bond. 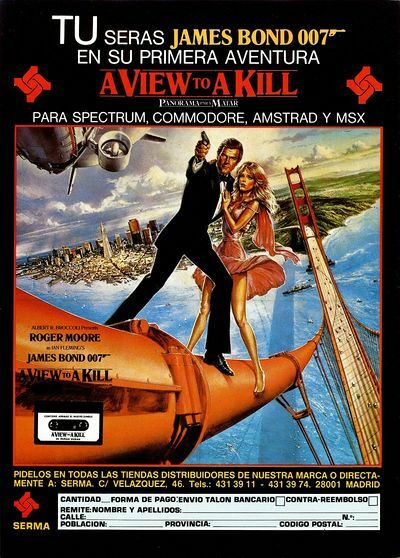 The original film songs "The James Bond Theme" by Monty Norman and "A View to a Kill" by Duran Duran and John Barry are used as background music. "My name is Bond - James Bond..." with this famous words the game starts. 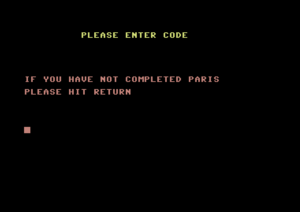 In each part of the adventure 5-digit codes are hidden. They need to be entered at the beginning of the other parts. 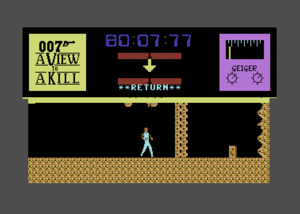 By means of these randomly generated codes, the game recognizes to what extent your tasks as James Bond were fulfilled in the previous parts, as well as points and the time elapsed. From time to time a voice sounds. Listen carefully. 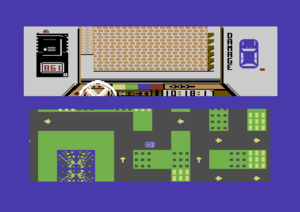 Each part of the game has a correspondingly divided screen, in which different views are shown. 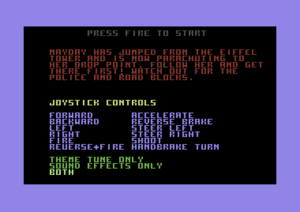 Game 1: 3D view in the car, 2D view of the streets of paris with obstacles and the meeting point with May Day, time display running backwards, damage display of the car. 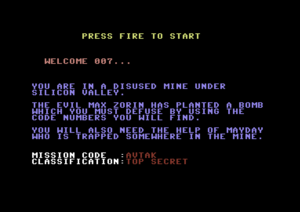 Game 3: The mine is a so to speak a jump&run game, in which different items are collected, Geiger counter (shows the closeness to the bomb), inventory and word list, time display running backwards. A racy car drive through Paris, to meet agent May Day at Eiffel Tower... Try to keep the damage on the car as low as possible, drive in the given driving direction, avoid the road blocks, the police and the wrong-way drivers. You are allowed to shoot! Escaping the blazing flames is only possible with a series of numbers that fit into the code holder. Then, this has to configured so that it unlocks the door locked with a secure padlock at the lower right corner of the city hall. The rendezvous is supposed to take place next to the jack at the deep mine. Do not forget to release May Day, before you leave the place. The final: Not too much should be revealed! Heinrich Lenhardt in the Happy Computer: "In this complex programme you play three key scenes of the movie. The title song by Duran Duran and the Bond theme sound from the speakers not with Ghostbusters standards but still very worth listening to. The famous lead of the Bond movies was also realized very well. 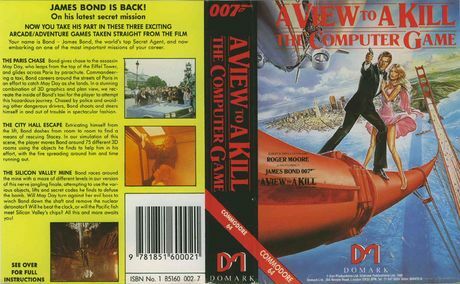 A View to a Kill combines three different skill games to one programme. No worldshaking software event, but a successful adaption of the movie, which does not bore you so quickly." Jodigi: "The game idea is good, but the game parts are realized badly." 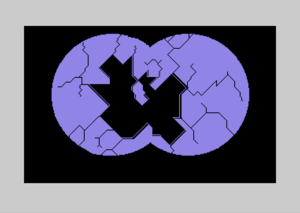 Shmendric: "During the title tune the gooseflesh started, here also the (grotty) speech output sequence cannot rescue anything. The game looks graphically, as if it was painted by kindergarden children. Concerning these points, I have a relatively contrary impression than the Happy Computer review (see above). Concerning the character one refuses to acknowledge it as James Bond, thats how miserable it looks. 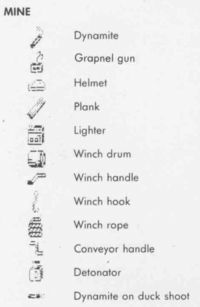 The ideas are nice, but no fun in the game can arise with such a technical botch. 2 points." 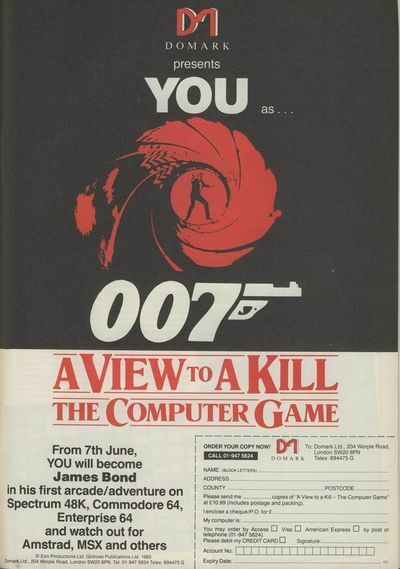 Roger Moore played James Bond for the seventh and last time, when the movie James Bond 007 – A View to a Kill was played in the cinemas. It was officially the 14th part of the series and came up with relatively known stars and lots of action. The super villain Max Zorin tries to raze Silicon Valley to the ground with a fake natural disaster, which the agent in the Service of Her Majesty can hamper successfully. This page was last modified on 20 February 2017, at 03:43.